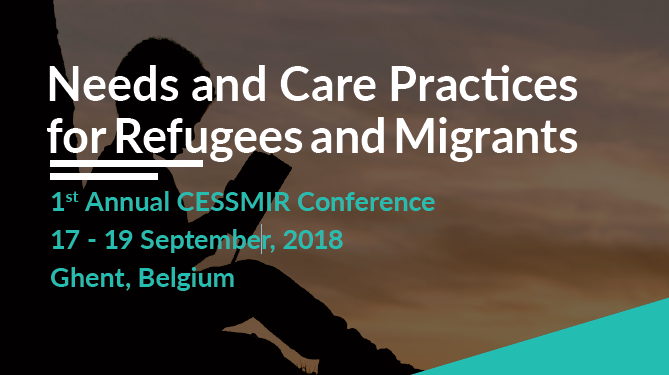 In partnership with Ghent University‘s Centre for the Social Study of Migration and Refugees (CESSMIR) maHp will be co-hosting this first annual conference on Needs and Care Practices for Refugees and Migrants in Belgium on 17-19 September. The migration and mobility of people, whether forced by circumstances of violence, conflict or poverty or as a certain choice during people’s live, is a phenomenon of all times. However, worldwide globalisation processes have accelerated these phenomena and the influences they have on the social, cultural, economic and political fabric of societies. On top, several conflicts worldwide have created a significant increase in the number of refugees seeking protection in different parts of the world, including the European continent. We invite scholars, policy makers and practitioners to discuss their perspectives and experiences on the compelling needs of different groups of refugees, migrants and newcomers in a global perspective and the diverse ways to address these needs. We hereby want to focus on interdisciplinary, transdisciplinary and transnational perspectives. Submissions will be welcomed on the following conference streams, which you will need to choose one from during submission of your paper: (1) Education, language and integration, (2) Work, (3) Wellbeing, identity and resources, (4) Health and health care, (5) Trajectories and place-making, (6) Law, asylum & rights and (7) Reception & housing. More information about this conference as well as about the CfP, including guidelines for submitting your abstract, can be found here or on the Ghent University/CESSMIR website. 0 Comments on "Call for Papers: Needs and Care Practices for Refugees and Migrants"